A couple of days ago my mother went to a restaurant I used to spend a lot of time at when I was a kid. Since my mother didn’t cook, we would go there 3-4 times a week. The rest of the week, we’d spend at other restaurants’. This time I didn’t eat with her. Once at the restaurant, she called me to ask if I wanted anything. The sugarholic inside me asked for a piece of carrot cake. 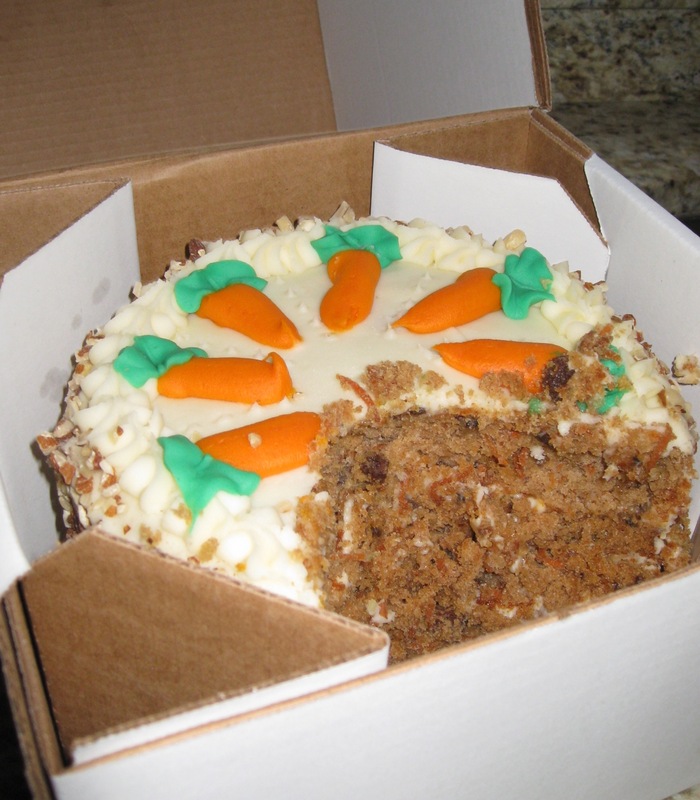 I told her I wanted ‘a carrot’, thinking she would understand it meant a piece of carrot cake. I guess I should have been clearer. Imagine how surprised I was when my mother called me up again asking for help. She told me the piece of cake was too heavy for her to carry to the house. I wondered why. When I got to her car, I found a gigantic carrot cake. This thing must have been at least 10 pounds! I brought it home and figured I would freeze it and get a treat later this week. I ended up leaving it in the fridge just in case. I felt strong enough to resist the temptation until last night. Around 7pm, I heard the call of the carrot cake. Luckily, I only had one piece. I wanted to hide the rest in the basement refrigerator but there is no room. Hopefully, I will not get tempted to eat another piece tonight, or even worse, eat the whole cake. I have discovered I have no self-control whatsoever when I am facing sugar-based desserts in the house. I want to say I will not eat the cake all at once but I cannot predict or promise anything, I wish I could. My new motto: Stay away from things you can’t handle and don’t let your entourage sabotage your diet. How do I prevent myself from binging though? Is it only about will power? This entry was posted in Food, Hot Topic, Personal, Uncategorized and tagged Barry Roskin Blake, Binge eating, Carrot Cake, Diet, finding thin, health, Sugar Addiction. Bookmark the permalink. After eating half of the cake in a few days, I decided to give the cake away so I wouldn’t be tempted anymore. If something like that should happen again, you have to just give it away immediately, after you take a sliver of a piece out, of course. That’s your treat…you wanted 1 piece of cake, so thats all you get. It’s okay to eat it if you can do it in moderation. If not, then you must stay away. Nobody is saying forever, just for now. You have to make yourself strong enough….it’s a process, you know that. If there is nobody to give it to, throw it out. I am a sugar freak too. I would rather live on cookies and ice cream my whole life. I’m not too big on cake, but I do make sure I at least take a piece so I can eat the buttercream. UGH! How long does it take to eat it, and then how long do we feel bad for? It’s not worth it. You have to change your ways…..It makes you a stronger person & your self esteem will fly high.